You can prevent frozen pipes or lower your chances of frozen pipes by making sure your home's plumbing is well insulated and protected from outside temperatures. If a vacation home is not going to be occupied during the winter months in an area of the country that can freeze, people will often call on a plumber to winterize their home to prevent pipes from freezing. If you have frozen pipes or if your frozen pipes burst, you are going to have to call a plumber to repair the frozen pipes. 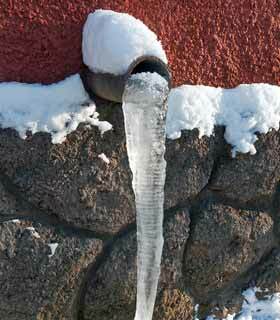 Be aware that sometimes burst frozen pipes may not be immediately noticed until the pipes thaw. You do not want to deal with further damage of your home and belongings, so it's important to call a plumber right away. Knowing where your water shut off valve is also important. There are many methods that are tried when it comes to attempting to thaw frozen pipes. Depending on where the pipes are frozen and what types of pipes you have, the best method of thawing may vary. Please be very careful if you attempt to thaw a frozen pipe. Do not use an open flame of any kind. Be aware of the possibility of fires or electrocution. Hair dryers and other home remedies may not be advised in certain situations and once again, it's best left to the professional plumber to point you in the right direction. If you call a plumber to fix your frozen pipes, you need to also take into consideration if your frozen pipes are an isolated incident. If your home heating was not working and you came home from a trip to find frozen pipes, then you might be able to get a plumber out right away. If however your region is experiencing sever freezing temperatures for a long time, then don't be surprised if you cant get a plumber for a couple of day. This type of freeze is very rare, but it does happen and the plumbers in your area are going to be booked up for a while. If you are lucky, you already have a reliable local plumber you can count on in an emergency situation. Frozen pipes are dangerous because water expands when it freezes. When water in pipes freezes this expansion exerts significant pressure on the pipes. Even pipes that are in perfect condition can rupture. Pipes can freeze in both northern and southern regions of the United States. In the north, where freezing temperatures are common, pipes are usually designed to go inside of the building’s insulation. However, in extremely cold weather, even pipes located inside the insulation can freeze. During long periods of extreme cold temperatures and power outages, any home can experience frozen pipes. In the south, where freezing temperatures are relatively rare, pipes are often located outside of the building’s insulation. In this case, the pipes without insulation are in danger of freezing when the temperature drops below twenty degrees Fahrenheit. Most big city areas in northern USA like Chicago, NYC and New England states like Rhode Island, MA and New Hampshire are used to cold weather and the homes are well protected. High winds during blizzards can knock out power and even the best insulated home could run the risk of frozen pipes. Do not apply extreme direct heat with an open flame device such as a blowtorch. Apply gentle heat is the way to go as long as you are careful to avoid electrical dangers if exposed to water. Best bet is to call a licensed plumber always. If you cannot locate the frozen sections of pipe, if you cannot reach the frozen pipe, or if you cannot thaw the frozen pipe safety, call a professional plumber. Drain water from water sprinkler supply lines and swimming pools, according to the manufacturer’s directions. Drain and remove outdoor hoses. Look for water lines located outside the building’s insulation, in areas such as crawl spaces, attics, basements, and garages. Have these pipes insulated. Devices known as "pipe sleeves" are designed to protect your pipes. If you have water supply lines in your garage, keep the garage door closed. Open cabinets under kitchen and bathroom sinks. This will allow the warmer air from the home to spread around the pipes. If you have exposed pipes, when the weather is especially cold, let the cold water drip. 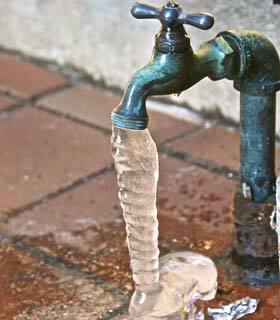 Even a small drip will help prevent pipes from freezing. If your home is not in use, leave the heat on, setting your thermostat no lower than fifty-five degrees Fahrenheit. Attempting to thaw frozen pipes can turn a problem into an emergency. Every year, people cause severe damage to their homes by trying to thaw frozen pipes. Unfortunately, fires, flooding, and water damage can occur.